The recipe for the ‘perfect power bowl’ comes down to macrobiotics, and here we show you our favourite ones featuring Giving Tree crisps as healthy, crunchy toppings for these bowls! The smoothie bowls are still in, but this latest food trend is totally savoury. Introducing power bowls, or the latest way to eat your lunch like the chic, wellness-obsessed set. Basically a bowl filled with vegetables, whole grains and protein, the power bowl ticks all the right boxes. These recipes we feature are so simple to make and the more variety of veg the better – we like to say ‘Eat a rainbow’. There’s a science to the ‘perfect power bowl’, which basically comes down to macrobiotics. 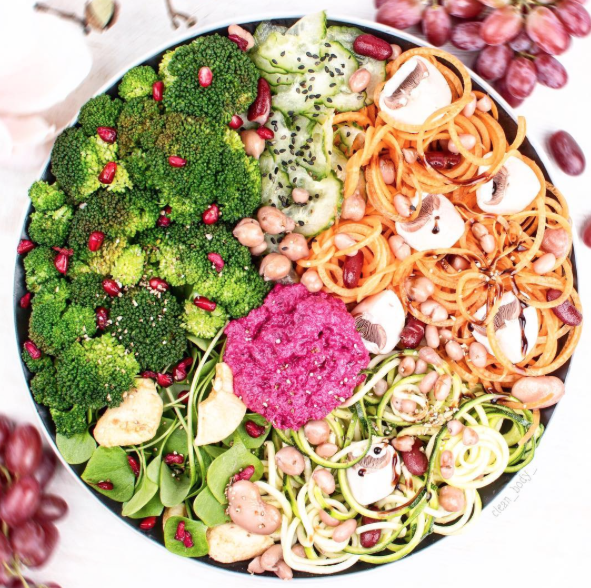 The most powerful Power Bowl consists of 15 per cent lean protein, 25 per cent whole grains, 35 per cent vegetables, 10 per cent sauce and 30 per cent extras (including nuts, seeds and sprouts). 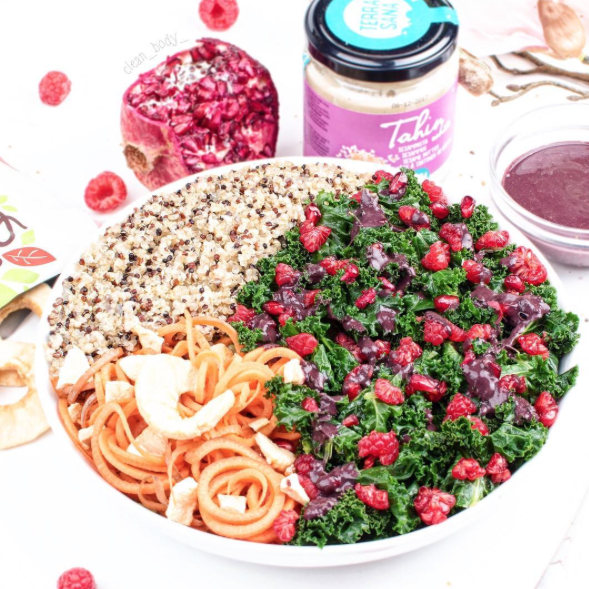 This wonderful bowl consists of Spiralized veggies, and a cucumber sesame salad, raw mushrooms, broccoli, mixed cooked beans, beetroot hummus with lots of tahini, mixed greens and @givingtreesnack apple crisps plus fresh pomegranate seeds. It adds a different dimension adding sweet and crunchy flavours to savoury too! Here are some great ingredients to add to your shopping list if you want to recreate your own at home include quinoa, beetroot, sweet potato, seeds, nuts, chicken, black beans and avocado (of course). When perfectly arranged so that you can see everything in it, the bowl provides a much more photogenic alternative to the traditional plate. Fans of the bowl say that it is like a ‘hug’ in a meal, and Instagram already has tens of thousands of posts with the hashtag #powerbowl accompanying their filtered snaps. For those who are sick of their regular plate of salad at lunchtime and who fancy something with a little bit more symmetry and harmony than a few pieces of wilting lettuce, try the power bowl in replacement.